One of Northern Ireland's most successful businessmen has called on Sinn Féin and the DUP to resolve their differences. Bill Wolsey, who helped transform hospitality in Belfast, said: "We have replaced the men of violence with the women of intransigence." He said Michelle O'Neill and Arlene Foster should resume talks urgently. His portfolio includes Belfast's Merchant and Bullitt hotels and the National Cafe and Dirty Onion bar. 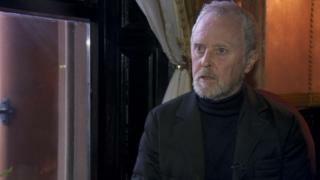 Sinn Féin criticised Mr Wolsey's comments, describing them as "sexist", while the DUP said it was not responsible for the collapse of the NI political institutions. The businessman was a remain supporter in the Brexit referendum in 2016. He now supports leaving the European Union on terms agreed between Prime Minister Theresa May and the EU. Mr Wolsey, whose Beannchor Group recently announced the development of a new hotel in Lisburn, accepts that he has no political mandate, but says that he has a stake in what happens in the future. He said: "I don't live in some bubble. We employ people from every socio-economic group there is. "I employ people from all over this city and I have done for the past 40 years." Mrs Foster leads the DUP while Michelle O'Neill is the vice-president of Sinn Féin. In a message to Mrs Foster and Ms O'Neill, he said: "They have a huge mandate. That is true. "But the people did not vote for them not to even sit in the same room together." Mr Wolsey urged the two party leaders to get together and settle on an agreed way forward. Sinn Féin MLA Caoimhe Archibald said there was "no place in society for sexist comments". She defended her party, saying Sinn Féin had negotiated with the DUP for months to reach an agreement in February 2018. "The DUP walked away and have now checked out of power-sharing. The political institutions can only be restored on the basis of equality and genuine power sharing," Ms Archibald said. A DUP spokesperson said it did not collapse the NI political institutions and it stood "ready to restore the institutions immediately". "We have no red lines. "Only one party out of the five is refusing to appoint ministers." Northern Ireland has been without a devolved government for two years since the collapse of the last Stormont executive.